I have this tendency to make my mind up about things before I really give them a chance. Let’s take movies for an instance, sometimes, for whatever reason, I’ll decide that a certain movie isn’t my cup of tea…before watching it. I may not like the actors in it or maybe I the storyline doesn’t interest me. For example, the movie War of the Worlds. Josh dragged me to this movie practically kicking and screaming. I have no idea why I didn’t care about this movie – I mean, aliens taking over the world and the human race being completely obliterated. What’s not to like? Oh yeah! Tom Cruise was in it, and at that stage of his life and career, I found him to be obnoxious. I’m in love with being in love, too, but I don’t go jumping off of people’s couches to prove my point. But you know what? I loved the movie! Yeah, like, I wanted to see it ten more times. I liked it as much as I liked Edge of Tomorrow (or more well-known by Live. Die. Repeat.). But sometimes my instincts are right. And sometimes, I’m wrong about food, too! Like with mushrooms. All of my life, I’ve hated them. It goes back to when I was five or six years old and a kid in my neighborhood convinced me to eat the mushrooms out of my front yard. So I did. They tasted okay. Fast forward to an hour later where my mom is serving pizza with mushrooms on it and I declare, “I like mushrooms now.” Obviously, this made her suspicious and she wanted to know why I had a sudden change of heart. I told her and then I got swept up over to the poison control center, where luckily I did not have to my stomach pumped. That experience scarred me and I was never going to touch another mushroom. Until my daughter Eden came along…and decided to get adventurous one evening at a Japanese restaurant…and fell in love with them! Since we’re always encouraging our kids to try knew things, Josh and I decided that if Eden liked mushrooms, we needed too, as well. So, we started cooking with them more. Then, in one of my Homemaking & Hospitality classes we made this dish for dinner and the mushrooms won me over for life. A mushroom convert I am now, and I’m here to help you become a mushroom convert, as well. (Editor’s note: Knock, knock.) 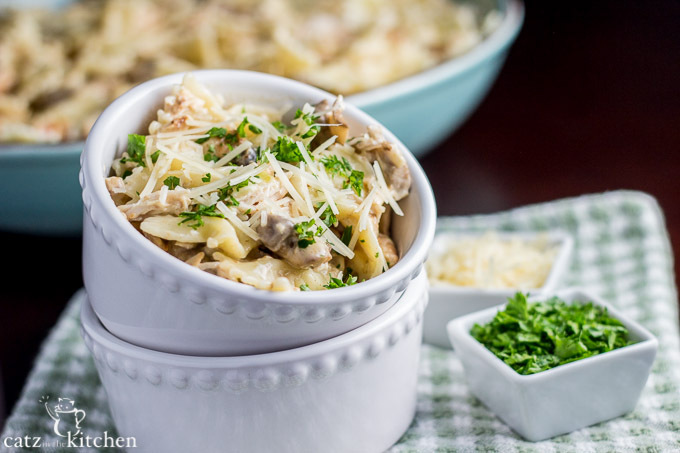 I promise, you will love them in this creamy pasta dish tossed with moist and succulent chicken and tender mushrooms that have been sautéed in BUTTER. C’mon, you know anything cooked in butter is just amazing. Have Julia Child and Ree Drummond not taught you anything? Don’t believe me? Try it for yourself. 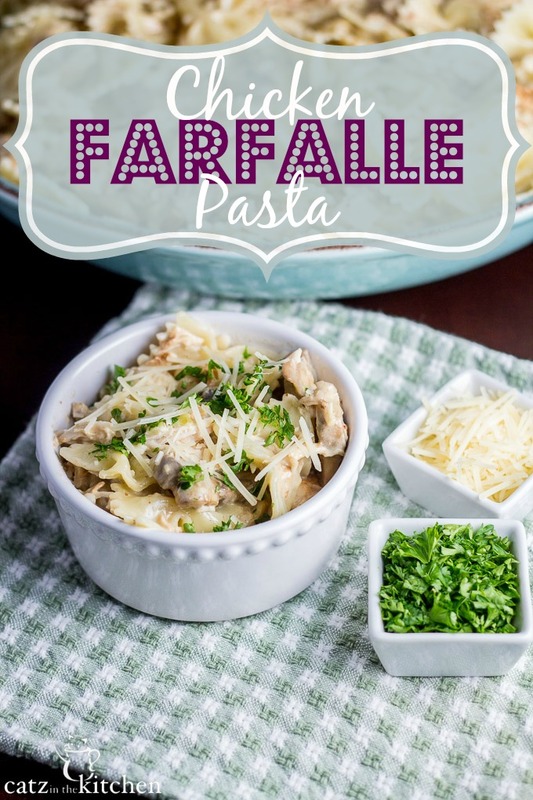 This slow-cooker chicken Farfalle pasta recipe is creamy, tasty, easy, and elegant. Wanting to win your kids over to mushrooms? This is the ticket. Place chicken in the crockpot with bottle of marinade on low for 6 hours. Place cooked chicken on a plate and pull it apart with forks. Set aside and allow to cool. Saute mushrooms in 2-4 tbsp of butter in a skillet on medium-low heat until softened, 5-8 minutes. Boil the pasta according to box directions. In a saucepan, melt the 1/2 cup butter and add the minced garlic, cream, pepper, and Parmesan cheese. Whisk on low heat for 3-4 minutes, until slightly thickened. 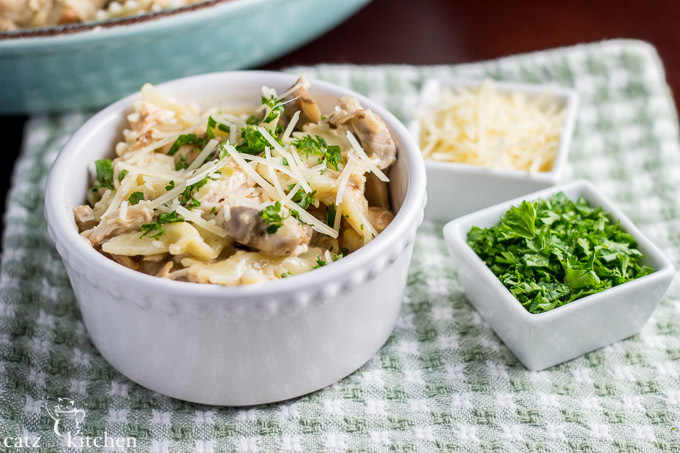 Pour sauce and mushrooms over drained pasta and add the chicken a stir. If adding crumbled bacon, add it to the top of the pasta and sprinkle a little bit more shredded parmesan cheese on top. 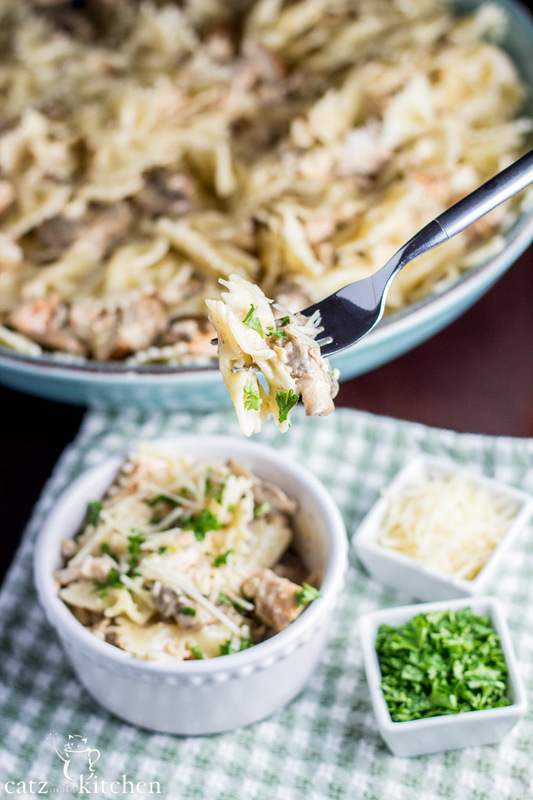 Craving a bowlful of this pasta right now.. it looks so creamy, cheesy and delicious. 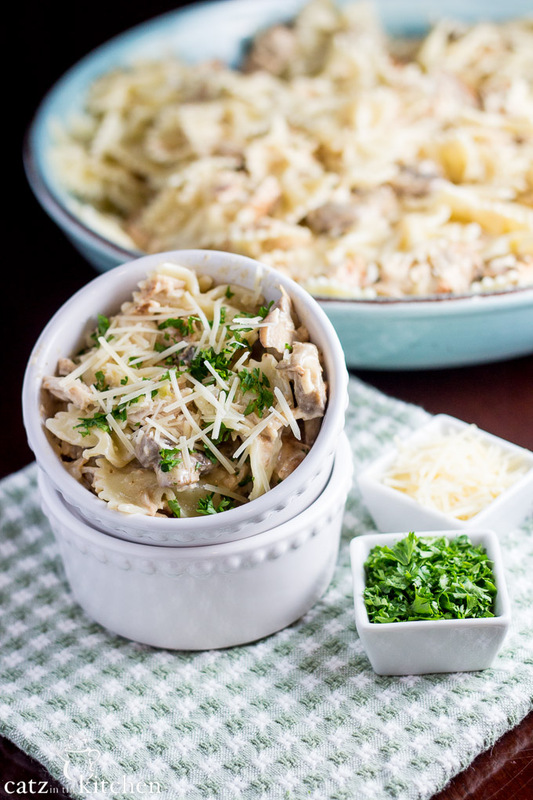 You can never go wrong with the combination of chicken and mushrooms!